Yoho, named for a Cree word expressing awe, is a park of rock walls, waterfalls and glacial lakes. Established in 1886, the park currently spans 1,310 square kilometres on the western slopes of the Rocky Mountains. 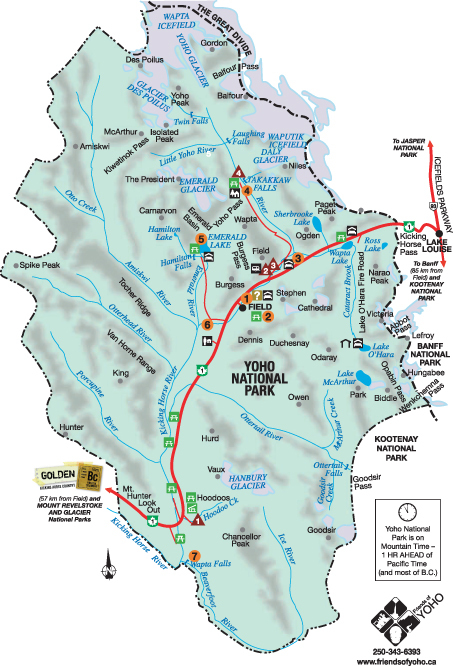 It borders Banff National Park to the east and Kootenay National Park to the south. Yoho is a park with snow-topped mountain peaks, roaring rivers and silent forests. Its history is bound up with a railroad: spiral tunnels inside mountains and stories of runaway trains. Be sure to read our story entitled Lady Agnes and the Cow Catcher. Yoho’s craggy peaks and steep rock faces posed an enormous challenge for Canada’s early explorers. The mountains that were the curse of railway builders are responsible for the park’s many waterfalls including Laughing Falls, Twin Falls, Wapta Falls and one of Canada’s highest at 254 m, Takakkaw Falls. View this guide to exploring Yoho National Park throughout the year. There are more activities than you might realize! Just off the Trans-Canada Highway. 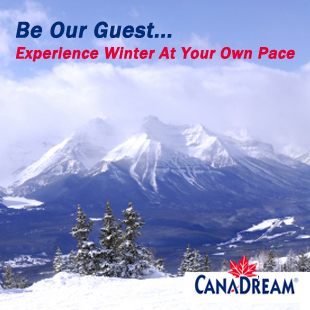 Parks Canada and Travel Alberta Information Desks Open May 1 – Oct. 14 Phone: 250-343-6783. Friends of Yoho National Park Gift Shop Burgess Shale fossil displays. 27 km (30 min) west of Lake Louise, Alberta – most services. Quaint mountain town with numerous Guesthouses and Bed & Breakfast Accommodation. Historic Site 8 km (5 min) east of Field. Engineering marvel constructed in 1909 for rail safety. Interpretive exhibits. Closed in winter October – April. 17 km (25 min) from Field. In the Cree language, Takakkaw means “magnificent.” One of the highest waterfalls in Canada. Walk to the base of the falls, or start a magnificent day-hike or back-packing trip on one of the nearby trails. 11 km (15 min) from Field. A jewel of the Canadian Rockies. A 2 hour trail circles the lake. Sweet in the summer and incredible on snow shoes in the winter. Public parking available. Shuttle service from guest parking lot to Emerald Lake Lodge. Open year-round. 4 km (5 min) west of Field. A natural rock bridge arches over Kicking Horse River. 22 km (30 min) west of Field. In the Nakoda language of the Stoney Nation, Wapta means “running water” or “river”. Trail head is 2 km drive down dirt road, off of the Trans-Canada Highway. 90-minute round trip hike to see these impressive falls. Water is responsible for creating a natural rock bridge over the Kicking Horse River. Torrents have worn through a solid rock bed leaving a flat-rock bridge. Water erosion has also formed another Yoho marvel: balanced boulders on tall pillars of glacial till, called Hoodoos, found in the western end of the park. And silt, carried by streams from melting glaciers high on the mountains is responsible for the deep, rich turquoise colour of Emerald Lake and Lake O’Hara. One of the world’s most important fossil finds, the Burgess Shale, is located in Yoho. Designated a World Heritage Site in 1981, the Burgess Shale Formation contains the fossilized remains of more than 120 marine animal species dating back 515 million years. The Town of Golden is located in one of the most beautiful places on the face of the earth, at the heart of six of the most stunning National Parks Canada has to offer. Yoho and Glacier National Parks are less than a 45 minutes’ drive from downtown. Golden is the perfect base from which to make day trips to hike or see Lake O’Hara, Takakkaw Falls, the Burgess Shale, Emerald Lake and Rogers Pass. The Columbia Wetlands are also a must for bird and wildlife enthusiasts. The Kicking Horse River is world famous for white water rafting, and Golden is located at the point where it joins the Columbia River. If you prefer to stay dry, there are plenty of other activities; from hiking, golf at the Golden Golf Club, a choice of downhill, cross-country and urban biking trails or paragliding. Add to that horse-riding, and a host of family-friendly activities such as wildlife experiences at the Kicking Horse Grizzly Bear refuge and Northern Lights Wolf Wildlife Centre or fun at the kids spray park and outdoor swimming pool and you’ll see that Golden is a perfect spot for families to recreate. In downtown Golden make time to visit the Kicking Horse Pedestrian Bridge, the longest free-standing timber frame bridge in North America and also check out the Art Gallery of Golden, which showcases over 80 regional artists.